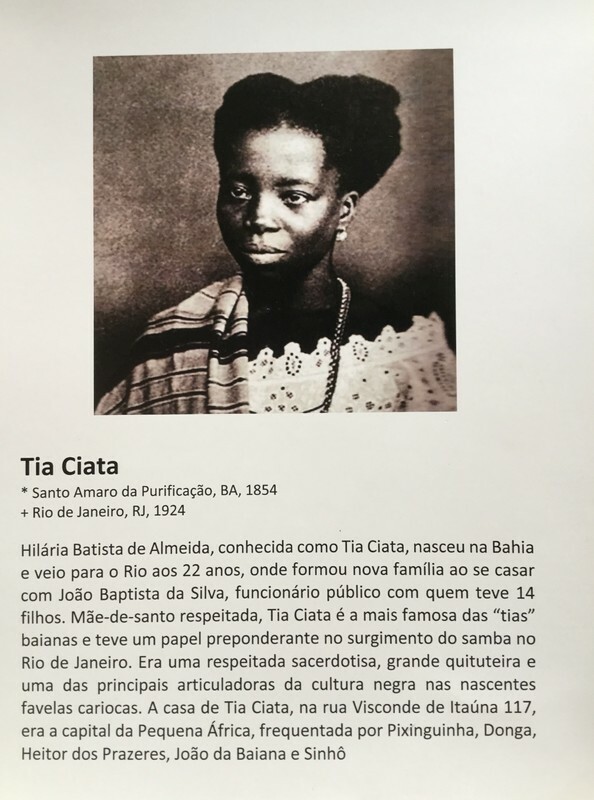 translation: Hilaría Batista de Almeida, known as Aunty Ciata, was born in Bahia and came to Rio when she was 22, where she formed a new family by marrying João Baptista da Silva, a civil servant with 14 children. A respected Holy Mother*, Aunty Ciata is the most famous of the “aunties” from Bahia who played strong roles in the birth of samba in Rio de Janeiro. She was a venerated high priestess, a great restaurateur, and one of the main articulators of the Black culture in the nascent Carioca favelas. Her house at 117 Visconde de Itauna Street was the capital of Little Africa, frequented by Pixinguinha, Donga, Heitor dos Prazeres, João da Baiana and Sinhô. *In Candomblé and other traditional African religions, both men and women can rise to the highest ranks in the religious orders and lead groups of practitioners and initiates in their rituals, teaching the wisdom, the traditions and the secrets of their sect. These leaders are called mãe-de-santo or pai-de-santo, Holy Mother or Holy Father.